The EXduro™ Support Systems consist of vertical hinges that are manufactured and designed in a way to permit free adjustments. 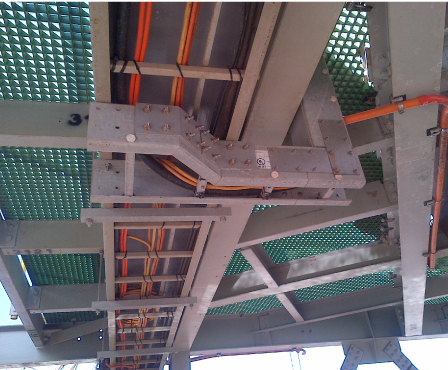 The riser system is supported through the help of angled splice plates. 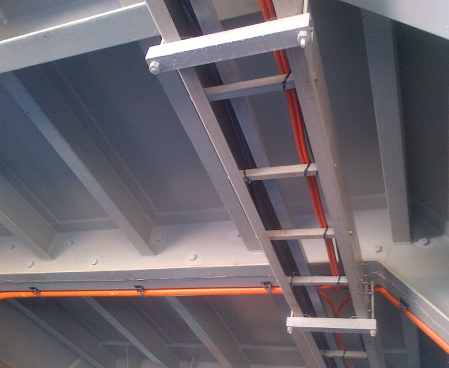 To ensure immovability of the ladder rung system, the edges of the support system are trimmed to prevent snagging. Unique methods are employed in designing the beams to ensure that the support systems can endure loading capacity and cross section. Snap locks are implemented to ensure that the trays stay in correct position. The FRP composite material ensures that the support system showcases enhanced performance over other materials even in low temperatures. Our products are devoid of halogen content and they will not undergo any permanent distortion or deflection. The application of Treadwell’s non-slip technology can be found in the implementation of our Duro Strut® support system. They help to connect different channel framing accessories and the support accessories are interchangeable with most other systems available. The FRP composite substance is light weight, non-metallic in nature and can be easily installed with the help of simple manual tools onsite. Additional instruments are easy to fabricate and cut. We offer our clients a huge range of accessories, such as clevis and pipe hangers, base plates, splice plates, fasteners and angle brackets, conduit pipe and support systems in conjunction with the Duro Strut® support system. We provide custom fabrication support systems to our clients and ensure timely engineering assistance. EXduro™ ceiling systems are considered to be an ideal replacement to metal. The installation process is cost-effective and the FRP composite substance makes the stands display its high quality and performance. The system remains consistent even in the direst of environmental conditions. The ceiling panels have intricate non corrosive properties, allowing them to be used on the most challenging of sites. Made of FRP, they do not corrode with humidity and moisture. The mounts may maintain a rigid structure, but are light in weight. Without the threat of peeling and blistering, there is also no need to paint them. These mounts can be used in both electric and magnetic fields, since they have strong insulating properties and are radio frequency (RF) transparent.